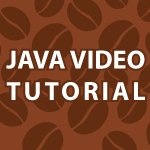 A long time ago I started my Java Video tutorial. When I started this I wanted to completely cover the Java language. So, far I’ve recorded over 64 videos that are over 14 hours in total length. I’m not near done with this tutorial, but I thought it would help if I combined all of these videos in just one post. Links to all of the code follows the videos. Videos on Android development, networking, design patterns and much more are still to come.